For 2017, choose from one, two, three, or four night trips to Lapland from Dublin with selected departure dates from Shannon and Knock with a flight duration of three and a half hours each way. All flights will arrive into Rovaniemi, the capital of Finnish Lapland. It is a small, compact, city that comes with a real buzz of modern shopping malls, lively bars, and restaurants serving up everything from traditional cooking to French cuisine. It also has the rather big draw of having Santa Claus on hand – not to mention Arctic wilderness that is perfect for snow sports and sleigh rides. It is recommended that you bring your own gloves (not woolly gloves, good thin insulated gloves ), hats, and scarves. Snow boots are provided for your own safety, it is advisable that these are worn at all times. It is Christmas all year round at Santa Claus Village, about eight kilometres north of Rovaniemi on the Arctic Circle. It is a novelty to send greetings from the post office, and there is the chance to learn about the history of Christmas traditions. The place gets busy at the end of November when there are concerts, gift bazaars, performances by Santa’s elves, plus the grand opening of Santa Park, Santa’s secret underground grotto. 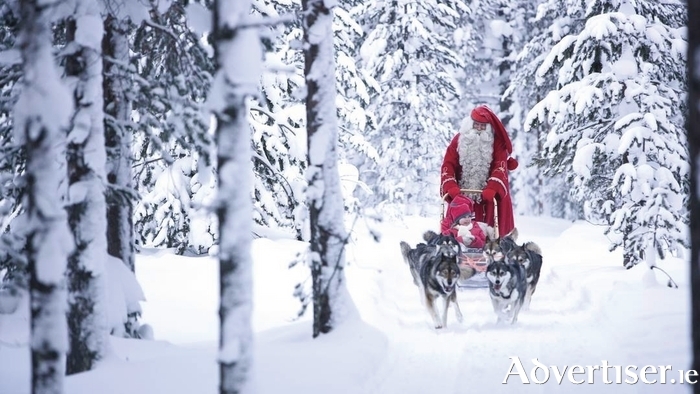 A holiday in Lapland is truly magical and one to treasure forever — call Corrib Travel on 091 564713 or pop into the office at 2 Eyre Square.